I couldn’t help but wonder from which rice paddy they culled some wizened old water buffalo as I chewed and chewed and chewed some more on a rather tough piece of meat. After a few more teeth grinding gnaws, I had to finally spit out this animal chunk looking much the same as when it had gone in my mouth a minute earlier. The “colorful” surroundings had me so distracted I hadn’t even realized this beef product resembling a piece of sinew packed gum was beyond any successful mastication. Yes, my surroundings. Where do we even begin for in Vietnam, the wild, wild west seems to reign supreme and patrons testing Darwin’s survival of the fittest theory is the only inspection food joints seem to receive. If we end up reliving a meal in reverse hunched over the porcelain god, it’s our own fault since personal responsiblity is all we have for protection against a bad meal. Follow the crowds, look for high turnover and things should turn out just fine. 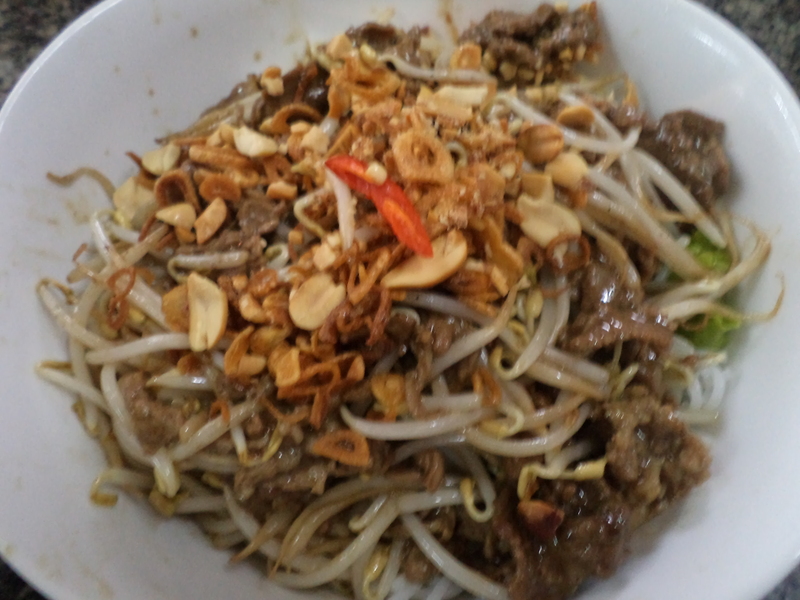 As I picked at this dinnertime bowl of bún bò chua ngọt, or sweet-sour beef noodles, in Hanoi’s Truc Bach Lake neighborhood, I got to thinking would an American health inspector have a coronary and stroke if he happened on by this open air place? The Centers for Disease control even publishes an online Food Safety Self Inspection Checklist in several languages including Vietnamese to help prod American food joints into some semblance of housekeeping in between regular inspections. How about we give the CDC’s list in italics here a test to measure up a typical Hanoi street eatery against some western standards. Restrict eating, drinking, or tobacco use in food areas. The man skillfully fried rice while handsfree dangling a cigarette complete with an inch long ash from his lips. Prevent discharge from eyes, nose, or mouth in food areas. The young guy cleaning chopsticks in dirty water formed a spit wad with throat rasping fanfare and expelled it with impressive force into the sidewalk. Check that hands are clean & properly washed. Grandma who was cutting raw meat with bare hands called out for the young chopsticks cleaner to bring her a towel which turned out to be the same dirty rag doubling as a counter wiper. Restrict bare hand contact with ready-to-eat and ready-to-serve foods. Why wouldn’t someone save time by touching cash and then going back to handling steamed rice and chopped herbs without gloves for time is money. Supply adequate hand-washing facilities and hand protection. The entire staff shares one dirty rag and a battered sink with no visible soap. Purchase food from approved sources, and no homemade foods. Unlike America, doubtful it is some Sysco truck is backing up to a service entrance under the cover of night. Receive food at proper temperatures and temperatures are logged. 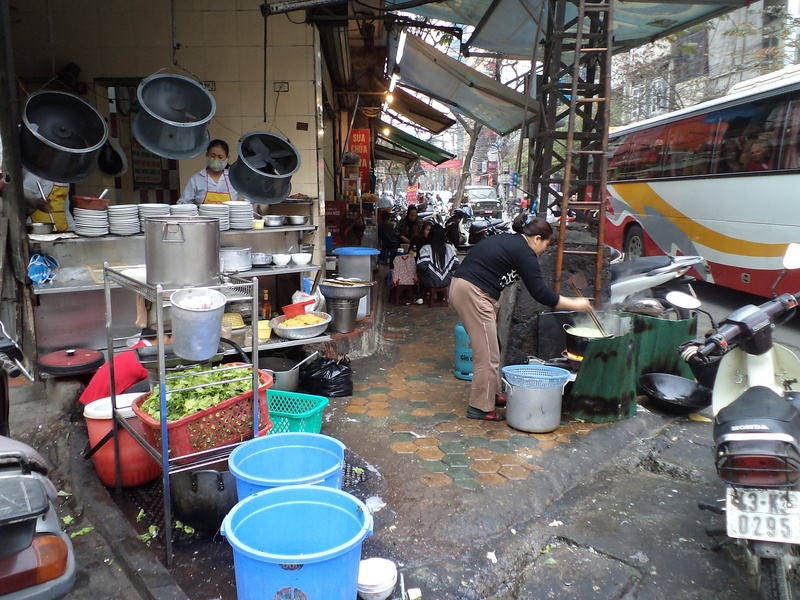 Raw and cooked foods hang out in uncovered bowls and buckets on the sidewalk awaiting further preparation or plating. Inspect that food is in good condition, safe, and no signs of tampering. With food incubating conveniently nearby on the sidewalk, the entire staff can watch over it. Cold winter air adds an added bonus of complimentary refrigeration courtest of our friends at Mother Nature. Maintain itemized supplier records onsite that are readily available. The food most likely came from the street market down the block where haggling most likely never yielded any sort of paper trail. Protect and separate food to protect against cross contamination. In a great show of efficiency, meats and vegetables are chopped and stored on the same cutting boards with the same knives. Clean & sanitize all food preparation areas. A univeral rag wipes down all surfaces and its dark color indicates it most definitely receives high frequency utilization for its intended purpose. Segregate or discard damaged food or returned food. Discarded food fills a red bucket stored near fresh ingredients awaiting their sterilizing sizzle in the wok. Log temperatures of cooking time & temperature. A flame under the wok indicates some semblance of heat shall be applied to raw ingredients. If raw ingredients change color or yield a different texture through the application of heat, the wok proved hot enough for the task at hand. Maintain proper hot hold heating temperatures. Upon leaving the wok or boiling vats, cooked food has reached its peak temperature prior to a one way slide towards outside air temperature. Log cooling time & temperature. If prepared foods do not burn to the touch, a proper serving temperature has been achieved. Summers in Hanoi prove uncomfortably hot and food will incubate in a natural solarium. Downright chilly and overcast winters in Hanoi provide several months of natural refrigeration. Maintain correct food temperatures at all time. Mother Nature’s temperature selection of the day shall maintain a steady food temperature at all times. Date mark & dispose of food if date has expired. The dry good sacks and boxes piled haphazardly anywhere space allows as well as tableside serving containers of hot sauce and vinegar appear to be either very old or very recycled. Properly label, store & use toxic chemicals. MSG is clearly stored in the original factory packed warehouse club size bags. Train employees on the dangers of these toxic substances. 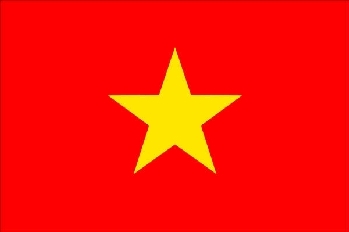 In Vietnam if we ignore something it will eventually disappear one way or another. Clean and properly maintaining physical facilities. A young girl runs around wiping down tables with the multipurpose communal rag. The sidewalk is cleansed of debris and meat drippings by periodic rains. Hot & cold water are available. Water is delivered at whatever temperature the pipes deem proper that day. Restrict unauthorized persons allowed in food areas. A public sidewalk runs right through the middle of flaming appliances and food storage baskets. Deter insects, rodents or animals. Strays are not prolific visitors to a Vietnamese city while rodents and insects are a natural addition to the cityscape. So American health codes would have us believe a container of sugar not labeled as such is enough to bring a restaurant’s patrons to their knees with incurable pestilence. With this overkill my frame of reference, I find it ironic indeed that I’ve had horrible food poisoning four times in the US, but have yet to become ill like that over here. Hopefully Vietnam will find a happy medium one of these days. But until then, I happily eat through bowls of noodles with tough beef in street food joints only to live another day and tell about it. Take that Mr. Health Inspector from the US! And yes, aside from a couple tough chunks of beef, this bowl of sweet-sour beef noodles was actually quite good. At $1.50 the price is right, and a steady stream of customers seems to agree. A whole wall menu of ideas will likely draw me back to this sidewalk turned kitchen.